As the University of California and Berkeley Lab prepare to discuss their proposal with the Source Evaluation Board next week in Chicago to continue their management partnership for the Depart-ment of Energy, Lab Director Steve Chu announced the senior management team he has assembled to carry out the missions outlined in the proposal. At the top of the chart is Graham Fleming, the internationally recognized spectroscopist and Physical Biosciences division director, whom Chu has tabbed to be his deputy director. Fleming will succeed Pier Oddone, who announced in December that he will leave this spring to become Fermilab’s fifth director. 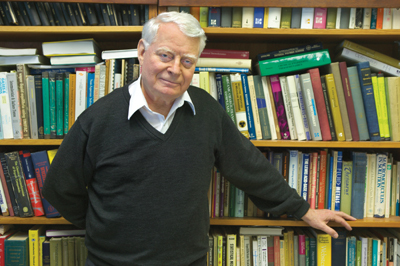 A distinguished researcher, teacher and administrator both here and on the UC Berkeley campus since 1997, Fleming is a world leader in the field of time-resolved spectroscopy. His campus service has included positions as co-director of the Institute for Bioengineering, Biotechnology and Quantitative Biomedicine (QB3), and faculty lead and advisor to the chancellor on the Stanley Hall replacement building. Berkeley Lab plans to be involved in both projects. The British-born scientist received his Ph.D. in chemistry from the University of London in 1974 and completed various research fellowships prior to joining the University of Chicago faculty in 1979. In 1997 he was appointed professor of chemistry at UC Berkeley and division director of Berkeley Lab’s Physical Biosciences Division. He was appointed associate director of Physical Sciences in 2001. He is also a Fellow of the Royal Society in England. The search committee for Fleming’s successor in Physical Biosciences has been formed. Chu has also announced the appointment of two new Associate Laboratory Directors (ALD’s) to go along with the three already in place. Paul Alivisatos, who has served as Materials Sciences division director since 2003 and heads the Lab’s Molecular Foundry project, will be ALD for Physical Sciences. In that role, he will oversee and coordinate responsibilities for the Advanced Light Source, Chemical Sciences, Environmental Energy Technologies, Physical Biosciences, and Materials Sciences divisions. And David McGraw, division director for Business Services, will assume the ALD for Operations position. His responsibilities will include Facilities; Environment, Health and Safety, including the Departments of Occupational Medicine and Workers’ Compensation, Physical Safeguards and Security, and Emergency Pre-paredness; the Administrative Services Department; both the Public Affairs and Human Resources Departments; and the Workforce Diversity Office. They join Joe Gray (Life and Environmental Sciences), James Siegrist (General Sciences), and Horst Simon (Computing Sciences) as Associate Laboratory Directors. Alivisatos is recognized internationally as one of the “fathers” of nanoscience. He joined the Laboratory staff in 1991 and has been instrumental in developing the concept and program for the Molecular Foundry. “Paul’s distinguished record, which includes membership in the National Academy of Sciences, will be of great benefit to the Laboratory as we chart our ambitious course in these fields,” Chu said. Alivisatos received his B.A. degree from the University of Chicago in 1981 and his Ph.D. in 1986 from UC Berkeley. After two years of postdoctoral work at AT&T Bell Labs, he returned to Berkeley in 1988 and rose through the ranks to become professor of chemistry in 1995, Chancellor’s Professor from 1998 to 2001, and professor of materials science and engineering in 1999. He is a world leader in the synthesis, characterization, and understanding of semiconductor and metal nanocrystals, and was among the first to publish results in this field more than a decade ago. He is a member of the National Academy of Sciences. McGraw is a highly regarded manager who has worn numerous hats since arriving at the Lab in 1991, including special operations deputy under former Deputy Director Sally Benson, division director of EH&S, and acting director of Public Affairs. He received the B. Ed. in biology in 1967 from the University of Calgary, the M.Sc. in plant physiology in 1974 from the University of Calgary, and the MPH in environmental science and industrial hygiene in 1982 from UC Berkeley. He was chairman of the Department of Environ-mental Sciences at Mount Royal College Calgary, Alberta, Canada from 1978 to 1981. In 1982, he joined IBM Corporation, working in the area of environmental health and safety. He moved to Apple Computers in 1989 to become manager of corporate environmental health and safety. Thirteen is supposed to be the most unlucky of all numbers, but not so for John Prausnitz, a chemical engineer with Berkeley Lab’s Chemical Sciences Division (CSD) and with UC Berkeley’s Chemical Engineer-ing Department. Prausnitz has become the 13th scientist at this Laboratory to win the coveted National Medal of Science, the nation’s highest scientific honor, given in recognition of outstanding contributions to the physical, biological, mathematical, engineering, or social and behavioral sciences. He will receive his medal from President George W. Bush at a White House ceremony on March 14. Prausnitz was one of eight researchers named to receive the 2003 edition of the National Medal of Science, three of whom are Bay Area residents. (The 2004 winners are expected to be announced later in the year.) His citation reads: for development of engineering-oriented molecular thermodynamics. Born in Berlin, Germany, Prausnitz became an American citizen in 1944. He joined the UC Berkeley faculty in 1955, the year he obtained his Ph.D. from Princeton University, after earning his bachelor’s degree in chemical engineering from Cornell University in 1950. He joined the Berkeley Lab staff in 1978. Prausnitz is considered one of the principal architects behind the design of modern chemical manufacturing processes, whose work dramatically changed how the thermodynamic properties of mixtures required for chemical processing are calculated. As a result of his efforts, large-scale chemical plants, such as petroleum refineries and facilities for the manufacture of polymers, plastics and pharmaceuticals are far more energy-efficient and less polluting than they used to be. The forest of towers at oil refineries are distillation columns that separate crude oil into a plethora of products such as gasoline, kerosene and heating oil. John Prausnitz developed the concepts that enable these columns to operate without the danger of fires or explosions, and without wasting energy or raw materials. In addition to his research, Prausnitz has also been a prodigious author, having written a textbook that is in its third edition, and a reference book now in its fifth edition, plus three monographs used by chemical engineers throughout the world, and a book on computer calculations of phase equilibrium that predated by some two decades the widespread use of automated, computer-based physical property predictions. The National Medal of Science was established as a Presidential Award by Congress in 1959. Luis Alvarez became the first Berkeley Lab scientist to win in 1963. Marvin Cohen and Gabor Somorjai, of the Lab’s Materials Sciences Division, won the medal in 2002. Construction has now begun for a telescope whose light-collecting “mirror” will be buried more than a mile beneath the South Pole ice cap. Dubbed IceCube because its array of detectors covers a cubic kilometer of ice, this telescope is designed not to capture starlight but to study the high-energy variety of the ghostlike subatomic particles known as neutrinos. Originating from the Milky Way and beyond and traveling to Earth virtually unobstructed, these high-energy neutrinos serve as windows back through time and should provide new insight into questions about the nature of dark matter, the origin of cosmic rays, and other cosmic issues. This is the first IceCube string of DOMs to be lowered down into a mile-long hole drilled through the Antarctic ice by jets of hot water. That far below the surface, blue light travels more than a hundred meters through the otherwise dark ice. Berkeley Lab is one of 26 institutes participating in the IceCube collaboration. Our researchers were responsible for the unique electronics package inside the digital optical modules (DOMs) that will enable IceCube to pick out the rare signal of a high-energy neutrino colliding with a molecule of water. A DOM is a pressurized glass sphere the size of a basketball that houses an optical sensor, called a photomultiplier tube, which can detect photons and convert them into electronic signals that scientists can analyze. “Each of these DOMs is like a server that you can log onto and download data from, or upload software to,” says Robert Stokstad of the Nuclear Science Division (NSD), who heads the Institute for Nuclear and Particle Astrophysics (INPA) and is the leader of Berkeley Lab’s IceCube effort. Equipped with onboard control, processing and communications hardware and software, and connected in long strings of 60 each via an electrical cable, the DOMs can detect neutrinos with energies ranging from 200 billion to one quadrillion (1015) or more electron volts. In the past few weeks, the first IceCube cable, with its 60 DOMs, was lowered down into a hole drilled through the Antarctic ice using jets of hot water. Plans call for a total of 4,200 DOMS to be put in place over the next five years. The Antarctic summer season, during which the weather is “mild” enough for work on IceCube to proceed, lasts only from mid-October to mid-February. After that, winter sets in and the climate is much too harsh for any outdoor work. When completed, IceCube’s total volume of detectors will be about 20 times greater than that of its predecessor, another South Pole high energy neutrino telescope called AMANDA (Antarctic Muon And Neutrino Detector Array) which has 680 optical sensors. “The South Pole might seem like an unusual place to build neutrino telescopes, but the Antarctic ice is very clear and very stable, and has relatively low background radiation levels,” says NSD astrophysicist Spencer Klein, who heads the physics analysis team for Berkeley Lab’s IceCube effort. 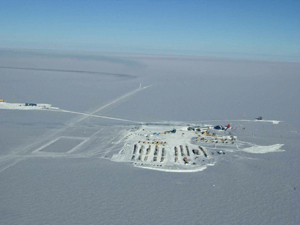 The South Pole might seem like an odd place to build neutrino telescopes, but the Antarctic ice is very clear and stable, and features relatively low background radiation. IceCube will be installed to the far left of the station shown here. Neutrinos are one of the most common and mysterious particles in the universe. Produced by the decay of radioactive elements and certain elementary particles, they carry no electrical charge and scarcely a hint of mass, which means they are unaffected by magnetic fields and rarely interact with other forms of matter. Able to escape from anything other than a black hole, their pathway to earth is essentially a straight line from their point of origin. Because these neutrinos are the only known particles able to pass through Earth untouched, scientists can point telescopes like IceCube and AMANDA to the northern skies and use the planet as a filter. While there are extensive ongoing studies of the neutrinos emitted out of thermonuclear reactions in the core of the sun, as well as antineutrinos from nuclear reactors, IceCube is designed to study the neutrinos spawned in the most violent of astrophysical events, i.e., supernovas, gamma-ray bursts, and cataclysmic phenomena involving black holes and neutron stars. In studying these high-energy neutrinos, scientists hope to be able to produce a map of the neutrino sky. Trillions of neutrinos pass through each square centimeter of Earth’s surface every second without a trace of impact. However, every so often, a neutrino does collide with an atom. This rare collision generates a muon, a heavy electron-like subatomic particle that, as it passes through ice or water, emits flashes of bluish light called Cherenkov radiation. IceCube’s DOMs can detect this light and scientists, by measuring the intensity and arrival time of the light at multiple DOMs, can reconstruct the directional path of the muon and determine the type, direction and energy of the neutrino that helped create it. This is critical for separating a muon generated by a cosmic neutrino from the millions more muons generated by cosmic rays in the atmosphere. 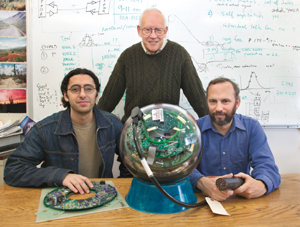 Azriel Goldschmidt, Robert Stokstad and Spencer Klein of the Institute for Particle Astrophysics at Berkeley Lab were part of the team responsible for the electronics inside the Digital Optical Modules (DOMs) that will enable IceCube to pick out the rare signal of a high-energy neutrino colliding with an atom of ice. 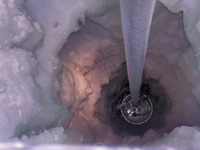 On the surface of the ice, located where the IceCube detectors emerge from the frozen depths, there is another array of detectors called IceTop. This past season, eight of the 160 tanks that will make up the completed IceTop were installed. Each tank is about two meters in diameter and will hold two IceCube DOMs frozen in water. A pair of tanks will be connected to each IceCube cable. IceTop will be used to calibrate IceCube and to study high-energy cosmic rays. The DOM integrated circuit was custom made at Berkeley Lab based on architecture developed by Stuart Kleinfelder, formerly of the Engineer-ing Division and now at UC Irvine. More than 30 Berkeley Lab scientists and engineers are involved in the IceCube project. Project leaders, in addition to Stokstad, Klein and Goldschmidt, include William Edwards of the Engineering Divi-sion, the project manager, and David Nygren of the Physics Division, one of the world’s foremost experts in particle detection. Construction of IceCube is projected to cost $272 million. The National Science Foundation is providing $242 million for the project, and an additional $30 million will come from foreign partners. The chocolates are almost gone, and the flowers are starting to wilt, now that Valentine’s Day is five days old. But here at the Lab, love continues to bloom. Among the 4,000 or so employees here, many are, shall we say: “romantically involved.” Here, we feature six such twosomes, though many more exist. Some met on the Hill, while others hooked up prior to working here. But regardless of how they met, their relationships help keep love in the air at the Lab. 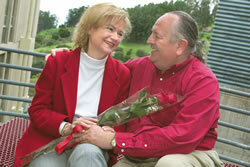 Faye Jobes, with the Creative Services Office, and John Hutchings, with Facilities, first met in 1985, when the two briefly worked together. 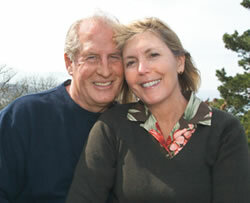 After going separate ways, they got reacquainted at a colleague’s retirement party in 2001. They were married last month. 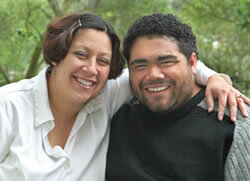 Jennifer and Frank Rosado, both with Business Services, have nearby offices. But busy workloads prevent them from seeing too much of each other during the day, so they catch up during their commute to and from work. Joyce Cordell-Breckinridge, with the Business Services Division, and James Breckinridge, head of Site Access, met after they “debated” an issue over a parking permit. They’ve been together ever since. 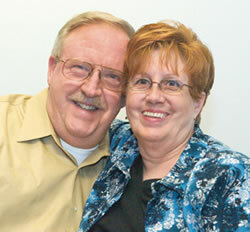 Ralph Sallee with Transportation and his wife Nancy with Business Services Division have been married for 27 years. 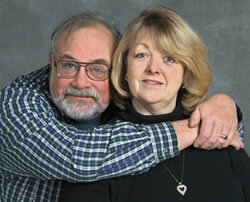 They met while teaching at the same school in Alaska. After retiring, they moved to the Bay Area. Nancy was first to get a job here and then encouraged Ralph to do the same. Roby and Bob Berninzoni, who both work in the Facilities Division, met after she reported a hill slide near her office in 1998. They’ve been married for four years now. Born on Saint Valentine’s Day in 1935 in the historic city of Bremen, Germany, Harald Rose is a theoretical physicist and pioneer in the field of charged particle optics who did much to improve the resolution of electron microscopes. On Monday, his 70th birthday was celebrated in a very special way — a day-long symposium at Berkeley Lab’s National Center for Electron Microscopy (NCEM). 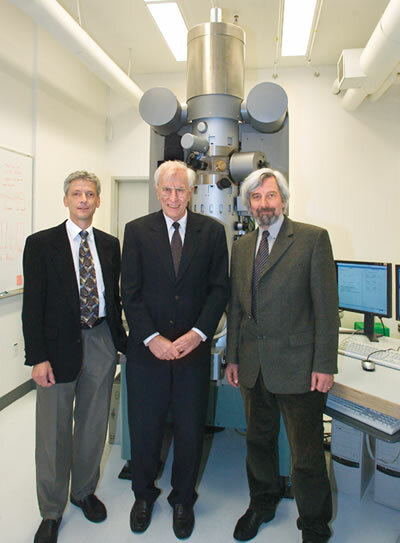 Harald Rose (center) with Uli Dahmen (left) and Max Haider at NCEM during the symposium in his honor. Entitled “Celebrating Four Decades of Electron Optics: A Symposium in Honor of Harald Rose’s 70th Birthday,” the February 14 symposium drew attendees from across the United States and abroad, including Rose’s protégé, Max Haider, cofounder and managing director of the CEOS company of Heidelberg, Germany. Haider opened the lectures with a presentation about Rose’s contributions to electron optics. Uli Dahmen, director of NCEM, was equally effusive in his praise of Rose. Rose earned a bachelor’s, master’s and Ph.D. in physics from Germany’s Darmstadt University of Technology, where he would spend much of his career. Since 2000, however, he has been “on the road,” spending a year at Oak Ridge and a year at Argonne National Labora-tories before coming to Berkeley Lab for a year-long appointment that ends this spring. While here, he worked on a book and taught a course on charged particle optics at the Advanced Light Source. He has also been doing theoretical work on a five-dimensional approach to relativistic quantum mechanics, which was recently published. As a theoretical physicist, Rose said the philosophy that has guided his career came from his mentor, Otto Scherzer, who taught him that “theory should be a means for designing things with an application.” It was in this vein that Rose achieved his primary claim to fame: developing a means of correcting aberrations caused by the magnetic fields that are used to provide rotationally symmetric lenses for electron microscopes. Whereas the resolution limit of optical microscopes is set by the wavelength of the imaging light, the resolution of electron microscopes is limited by spherical and chromatic aberrations. In accordance with a famous theorem posited by Scherzer, it has long been recognized that the magnetic lenses used in electron optics can never be completely aberration-free. Rose’s idea was that since aberrations endemic to rotationally symmetric electromagnetic fields themselves could not be removed, the solution was to add corrective elements, somewhat akin to slipping on a pair of glasses to correct the astigmatism of the human eye. How-ever, instead of a convex or concave lens, the aberration-correcting elements consist of sophisticated combinations of quadrupole, hexapole and octupole magnets, or an electrostatic mirror combined with a beam separator to separate the incident beam from the deflected beam. “The latter corrector design will be used for the PEEM3 microscope of the ALS,” Rose said. When an electron microscope’s beam passes through a precisely arranged array of these corrector elements, the aberrations introduced by the microscope’s magnetic or electrostatic lenses are either removed or minimized and the beam is properly aligned to yield a high-resolution image. Rose has thoroughly enjoyed his stay at Berkeley Lab. He loves the academic atmosphere, and, as an ardent hiker, the opportunities for outdoor activity. For nearly 60 minutes Kamala Harris kept her audience in the Building 50 auditorium rapt. San Francisco’s first woman district attorney gave a powerful talk on Monday in honor of Black History Month, recounting the civil rights movement in America and challenging everyone to keep up the fight for equality, human dignity, as well as for a more just criminal justice system. The talk put the struggle for civil rights in its historical, legal and even scientific contexts, with emphasis on the intersection between civil rights and criminal law. While focusing on the historic contributions of African Americans, Harris emphasized that the struggle for justice is not specific to any one group, and that the rights gained through this struggle and those still to be attained are not given by the state, but derived from natural law. Raised in Berkeley during the 1960s, Harris has mixed ethnic heritage — Indian on her mother’s side and Caribbean African American on her father’s. Her parents, both professors, were active in the civil rights movement and instilled in Harris a strong commitment to justice and public service. Harris’ mother, Shyamala Harris, a breast cancer expert at Berkeley Lab, was in the audience on Monday. Her sister Maya Lakshmi is also an attorney. As the highest law enforcement officer in San Francisco, Harris is especially concerned with balancing the power exercised by the state in protecting society at large with its duty to defend the rights of its weakest members. 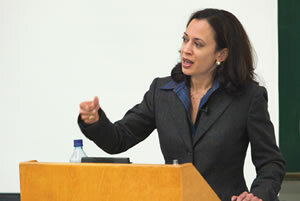 Harris thanked her scientific audience for the contribution science made to the criminal justice system — particularly the DNA fingerprinting technology which, Harris said, not only helps convict the guilty but also helped exonerate 156 wrongfully-convicted inmates. Harris’ talk was sprinkled with occasional and very poignant humor. Asked about her stand on Califor-nia’s “Three Strikes” law, she said she considers it to be flawed and that she is currently working with the state’s other district attorneys to change it. “That’s 58 of us in a group that does not look like me,“ she quipped. The crowd cheered. The overarching theme of Harris’ talk was that the struggle for civil rights is an ongoing one. “We have to realize that civil rights are being threatened in America,” she said. She pointed out, for example, that there is no national law protecting the civil rights for lesbians and gays, and that there’s a movement now to repeal the few state laws that have been enacted. President Bush sent Congress a lean budget request for FY 2006 on Tuesday. The news for Berkeley Lab, like the rest of the federal government, foretells a tighter-than-average year, but also with a mixed bag of positive developments on key Lab priorities. The Administration’s transmittal of the President’s proposed $2.57 trillion budget was the start of the annual months-long budgeting process for the federal government. Congress will now consider the President’s budget request and begin its deliberation on the appropriations bills that will set the government’s spending plan for FY06. The Department of Energy could be cut by approximately 2 percent and the Office of Science (SC) could absorb a 3.9 percent reduction. Cuts in SC programs such as Biological and Environmental Research (BER) of 21 percent, Advanced Computing of 10 percent, and smaller reductions in most other programs could mean a more constrained budget for Berkeley Lab than it’s had in several years. Even an increase in SC’s Fusion Energy Sciences could mean as much as a 50 percent reduction in Berkeley Lab’s fusion program — all of the increase in fusion going to the International Thermonuclear Experimental Reactor (ITER). On the positive side of the ledger, the Administration’s request includes $11 million to begin the full demolition of the Bevatron — a Lab priority for many years. Additionally, both the NASA budget and DOE’s High Energy Physics budget provide funding and positive direction for the Joint Dark Energy Mission, a program first conceived by Lab scientist Saul Perlmutter as the SuperNova Accel-eration Probe (SNAP). Funding for the Molecular Foundry’s final year of construction is included at $9.6 million. The Foundry is scheduled to open in FY06. Overall, the President’s proposed budget holds federal spending to a less-than-inflation 2.1 percent increase, with much of that going to the departments of Defense and Homeland Security. Other discretionary spending would be cut by an average of 1 percent, with most non-defense, non-security federal agencies and programs slated for flat or reduced funding. Don Medley is Manager of Gover-nment and Community Relations at Berkeley Lab. 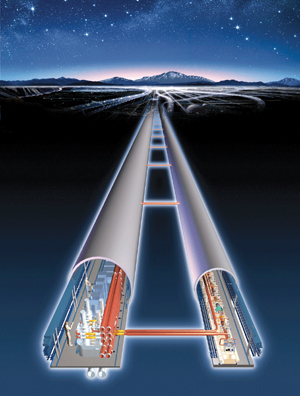 The Lab’s new online science magazine, [email protected] Lab (see story below), launches a series of articles about the science and technology of the International Linear Collider and the roles Berkeley Lab scientists are taking in the project. Following is a preview. Two high-energy physics projects promise to blaze an experimental path to new scientific frontiers, the realm where particle physics and cosmology combine. The Large Hadron Collider (LHC), already under construction at CERN, will begin operations in 2007. An equally ambitious undertaking known as the International Linear Collider (ILC), a next generation electron-positron collider, has yet to make it onto the drawing board; nevertheless the project is gathering momentum. 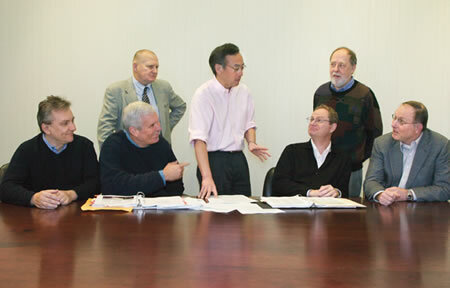 Berkeley Lab physicists are helping plan important aspects of the ILC. Marco Battaglia of the Physics Division is leading studies of anticipated physics and, with the Lab’s Engineering Division, researching possible designs for the detectors needed to observe a range of novel events with unprecedented precision. Andy Wolski of the Accelerator and Fusion Research Division is analyzing the challenges of the ILC’s damping rings, which must be able to condition tight bunches of electrons and positrons to enter the main accelerators at a rate of one every couple of hundred billionths of a second. A Japanese design for a powerful electron-positron collider. The International Linear Collider would be at least 30 kilometers long. CERN’s Large Hadron Collider will accelerate protons, massive, electrically charged particles relatively easy to accelerate to high energies in large numbers. Like all hadrons, protons are made of quarks; the interactions in a hadron collider are actually quark collisions, whose energy varies. With some 800 million proton-proton collisions a second, quark collisions in the LHC will be so many and so complex that sophisticated techniques will be needed to filter the interesting events out of the noisy background. Unlike hadrons, leptons — including electrons and their antiparticles, positrons — are light and pointlike: the energy of each event can be known exactly. The challenge for the International Linear Collider is to get enough high-energy collisions, since charged particles of low mass are hard to keep together. But the ratio of important events to noisy background events is much higher in a lepton collider than in a hadron collider. A mere 10,000 events of interest per year is ILC’s goal, few enough to store all the data and study every event in minute detail. To achieve unprecedented energy — half a trillion electron volts per beam — and unprecedented luminosity, the ILC will require extensive conditioning of the beams, especially the positron beams, in damping rings before they are injected into the linear accelerator. Experience with the Advanced Light Source — to whose electron storage ring the ILC damping rings are related, “except pushed to extremes,” Wolski says — has given Berkeley Lab an edge in the precision technology needed to meet the challenges posed by the damping rings of the ILC. All the particles predicted by the Standard Model have been found except one — the particle whose interactions with all the others determine their masses: the Higgs boson. The Large Hadron Collider will almost certainly find the Higgs, but because of its sensitivity and precision the ILC will be able to do more. The mysterious nature of dark matter is one example. The ILC will be able to measure the properties of candidates such as supersymmetric particles, or extra dimensions of space, with accuracy comparable to data from future satellites. Berkeley Lab’s preeminence in detector and sensor physics, including the Time Projection Chamber built for Brookhaven’s Relativistic Heavy Ion Collider and the Silicon Vertex detectors installed at Fermilab’s CDF experiment and elsewhere, mean the Lab has much to contribute to conceptually similar detectors needed by the ILC. In Beijing last August the technology panel of the International Committee for Future Accelerators recommended pursuing an accelerator design based on superconducting accelerating cavities. This major decision clears the way for the establishment of a Central Design Group to develop a detailed proposal and budget for the machine and its detectors. Not long after that, the international community will have to bring itself to address the most sensitive question of all: where the ILC will be located. [email protected] Lab, a redesign of the popular online science magazine Science Beat, debuts today. The online publication retains the best features of its predecessor while pointedly acknowledging the kind of science Ernest Lawrence pioneered when he founded the University of California’s Radiation Laboratory almost 75 years ago. These days everybody’s doing it, and it has a fancy name: multidisciplinary science. Individual researchers still come up with the bright ideas and do the hard work, but the walls between disciplines are rapidly dissolving in a research environment that increasingly draws on expertise from many different fields to make significant progress in one. [email protected] Lab’s audience includes thousands of readers identified as the “science-interested public,” people who aren’t specialists themselves but care passionately about what science portends for our society and the world. Professional science writers are core members of this group. But [email protected] Lab stories aren’t news stories. Instead, they look beyond press-release “breakthroughs” to examine what it takes to prepare the ground: the instruments, techniques, scholarship, discipline, and exchange of ideas without which progress is impossible. [email protected] Lab will tackle complicated stories in bite-sized chunks: each issue will have at least one installment “In Series.” In coming months look for series on renewable energy, carbon sequestration, bioremediation, nanoscience, the water-energy nexus, synthetic and in silico biology, and other emerging fields in which Berkeley Lab takes a lead. Like those of a cell, the membranes that divide [email protected] Lab departments are permeable. The Energy Bar, the Parallel Processor, Signals, and other departments will feature stories on energy and the environment, computation, biology, and more; if it’s hard to tell where a story really fits, that’s a good sign that cross-disciplinary science is thriving. The View’s “insider” readers are invited to look at the Lab’s public face by visiting [email protected] Lab at http://enews.lbl.gov/. Berkeley Lab presents a real challenge for bicycle riders. For one thing, the hills are steep — slow going up, and very fast coming down. The narrow twisty roads have limited visibility at turns and intersections. Add to this the rain and fog and heavy equipment vehicles and all those other elements that test a commuter’s patience. All that concerns Laboratory Director Steve Chu. 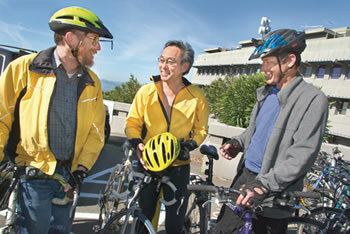 Lab Director Steve Chu (middle) is pictured with Steve Greenberg (left) and Bruce Nordman of the Bicycle Coalition. With Chu, it’s personal. He’s a bicycle rider who tries to bike to work every day from his Oakland Hills home, weather and meeting schedule permitting. He’s concerned for his safety, for that of his fellow riders, for pedestrians, and for the drivers of vehicles at the Lab. To raise awareness, he has authorized the issuance of a new Traffic and Bicycle Safety Policy that underscores the essential roles that all individuals have in ensuring the safety and well-being of bicyclists on Lab property. Central to the policy is one mandate — wear a helmet when riding a bicycle at the Lab — and one main request — obtain a permit for your bicycle at the Site Access Office and display it to simplify access through entry gates to the Lab grounds. The permit, which many bicyclists already possess, will also signify the recognition of safe bicycle operating measures, and it comes with a freshly minted copy of the new policy. Other points in the policy, currently in draft form, focus on adherence to the California Vehicle Code, obeying speed limits, ensuring that equipment like brakes and lights are working properly, and following Lab-specific parking and traffic regulations. The Director said his interest was heightened recently when he was almost struck by a bicyclist traversing the Lab in the dark without a light. He soon assembled a task force of representatives from the Environ-ment, Health and Safety Division and the Bicycle Coalition, a volunteer group of bike-riding employees who are dedicated to encouraging bicycle commuting through education and improved facilities. The policy that emerged has education rather than regulation at its core. The task force was sensitive to preserving the independence of bicyclists while recognizing their responsibilities to practice safe riding habits. He recalled a former graduate student of his at Stanford who flipped over his handlebars and, even with a helmet, ended up unconscious for hours — but alive, and he eventually recovered. A professor colleague of Chu’s wasn’t so lucky. A collision with a car left him a quadriplegic. So the awareness bar for safety is being raised for all Lab employees. Although injury statistics appear to be low, close calls have been more frequent. The unique terrain and high population concentration make a potentially hazardous combination. Pedestrians and bicyclists are the most vulnerable targets. The campaign’s first phase will include the bicycle policy, safety brochures, a question in the Traffic Safety section of the Job Hazard Questionnaire devoted to bicycle safety, and a web-based survey for bicyclists. The survey will be aimed at raising awareness of the new bicycle safety policy and identifying real needs of bicyclists to make the Lab more friendly to riders. Subsequent phases will address automobile, bus and pedestrian responsibilities. Voluntary bicycling permits are encouraged. All bicyclists must wear helmets. Bicycles, like autos and motorcycles, must observe all state laws (i.e. speed limits, traffic signs, headlamps after dark). Rear lights and reflectors are required. The use of flashing rear lights and reflective clothing and devices is also strongly encouraged. Parked bicycles cannot block access to buildings, safety equipment. See full policy draft at http://www.lbl.gov/ehs/misc/BicycleDraftPolicy.pdf. “Believe in yourself” is one of the rules Madeleine Jacobs lives by, and just one of the many words of wisdom she will extend to her audience at Berkeley Lab next Friday, February 25, during a special one-hour talk entitled “Ten Ways to Make a Difference.” And the pointers for success couldn’t come from a more accomplished person. 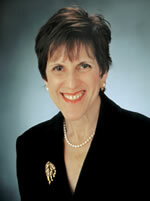 As the executive director and CEO of the American Chemical Society — the first woman to hold this position — Jacobs heads the world’s largest scientific society in the world, with a membership of more than 160,000, and a staff of approximately 1,900. Before her appointment as head of the ACS in January 2004, Jacobs served for 11 years as editor in chief of ACS’s weekly newsmagazine Chemical & Engineering News — the magazine’s first woman editor. In her dual roles as a chemist and science journalist, she has a proven track record of leadership and accomplishment in her field as well as a gift for communicating to a larger audience the role played by science — and chemistry in particular — in society. As such, Jacobs is a much-sought-after public speaker worldwide on topics ranging from gender equity in science to the challenges facing chemists in a global environment. (e-mail: [email protected], fax: X6641), or mailed/ delivered to Bldg. 65. Email address are included only in housing ads. Ads run one issue only unless resubmitted, and are repeated only as space permits. The submission deadline for the March 4 issue is Thursday, February 24.